One of our favorite things about Friends of the Soldiers Home is establishing connections that didn’t exist before. 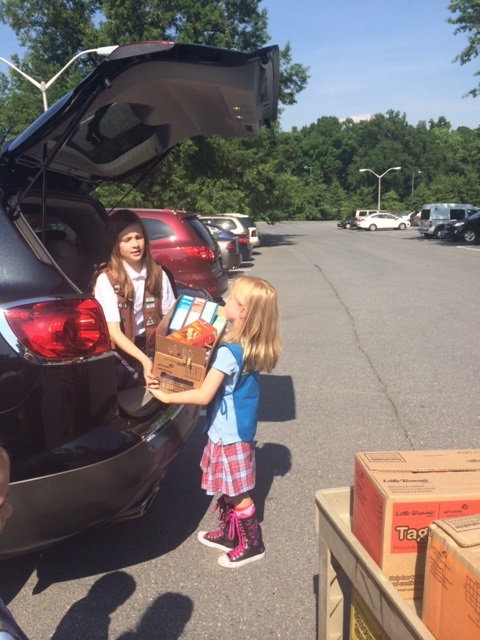 We were happy to assist Girl Scouts from Sacred Heart Church’s Daisy and Brownie troops in donating more than 100 boxes of cookies to the Armed Forces Retirement Home in D.C. on June 10. Julia Malloy, a Brownie, and Vivian Cronenberg, a Daisy, unloaded the cookies onto a cart in the Soldiers Home parking lot and then presented them to the Home’s volunteer coordinator, Carolyn Haug, as seen in the photos at right and below. The girls enjoyed a brief tour of the facility, met some residents and learned some of the ways their Gift of Caring cookies would be enjoyed in the months to come. We thank the girls’ mothers, Catie DeLong Malloy and Kelly Cronenberg, and all the others affiliated with the Girl Scouts troop, for making this wonderful donation happen.